You now have all seven stars, but there's one last thing you have to do. Go back to where you fought Alpha during the story. After defeating the now- pathetically-easy Forte, the toughest challenge yet awaits you. Prepare your folder long beforehand with 2xHero, PrixPowr, and BodyGrd, or some other all- encompassing PAs. Cyber Laser Blast does 200 damage. Alpha Arm Sigma does 200 damage. Alpha Arm Omega does 200 damage. Cyber Bullet Barrage does some amount of damage that's pretty big. Not enough to break a LifeAura, though. LifeAura will work wonders in this fight, since Cyber Laser Blast is easy enough to avoid, Golden Cyber Swipe doesn't do 200 damage, and if you're at the point where Alpha Omega is resorting to the Alpha Arm attacks, you shouldn't need much more protection. Remember that attacks done while the screen is darkened will not damage Alpha Omega if the core is not exposed; they will only expose the core. If you can pull the chips and destroy the core quickly enough, PrixPowr, 2xHero, and BodyGrd in rapid succession will destroy Alpha Omega. 900 + 700 + 1800 = 3400. When you defeat Alpha Omega, wait through the credits again. When the game restarts, check your pack to get your 19th Giga Chip, AlphArm[insert Greek letter sigma here]. To get your 20th Giga Chip, NetBattle someone else with at least one star and either version of the game. If you S-rank them, you have a 1/32 chance of getting Balance, which halves the damage dealt by each player. In addition to those requirements, you need to fight in a Middleweight Real battle. -- Control the flames with the D-Pad! 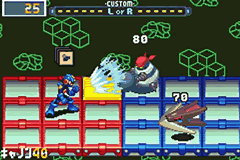 -- Control MetalMan by holding A and the D-Pad! -- Opens up a Hole! After you get 200 Standard Chips, 85 Mega Chips, 20 Giga Chips, and 7 stars, there's one thing left. The jobs! Unless you already did the jobs to open the Door of Trust in Secret 2. Oh well. and AceKard 3 3DS - Shipping WorldWide. 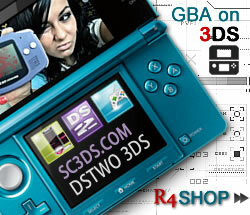 R4 3DS - AceKard 2i 3DS - R4i Card.